Firm: Martha L. King, P.C. 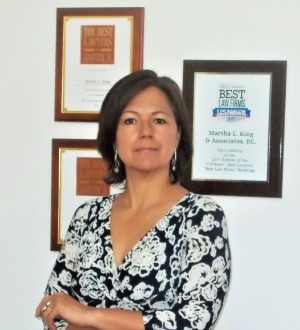 Martha L. King is the President and Managing Attorney of Martha L. King, P.C., a peer-rated professional services law firm included in Best Lawyers in America® and U.S. News & World Report® as a Best Law Firm in Native American Law in 2017, 2018, and 2019. She represents businesses with their law and policy drafting, employment law, administrative law, contract law, civil defense, and federal, tribal and state-tribal relations. She reviews contracts, agreements, leases, and other business documents. She advises on effective administration of programs, including personnel and operational issues. She assists them with business management structuring;observing corporate formalities; discharging fiduciary duties; and litigation prevention and litigation. The Managing Attorney is peer rated and included in the Best Lawyers in America® in Native American Law in 2016, 2017, and 2018. The Firm was peer rated and included in Best Lawyers in America® and U.S. News & World Report as a Best Law Firm® in Native American law.